I am a big fan of the peatier Scotch whiskies, such as Octomore, Lagavulin, Laphroaig and Talisker, but aside from describing them as "really peaty" or "wow, so much smoke" it can be incredibly difficult to describe a particular whisky to someone who hasn't drunk it. Is there a scale, so I can just say, "That's a 7" and be understood? 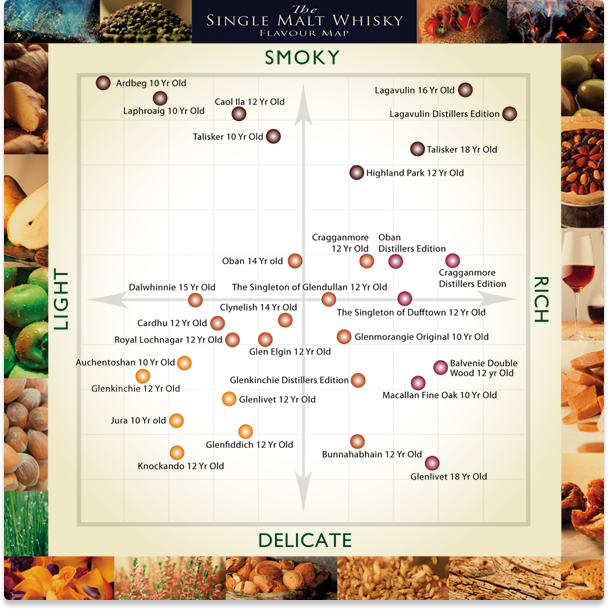 Of more use is a chart such as this one from malts.com, which gives a simple way to visualise where a particular whisky sits, and the distance between that whisky and others the drinker may have tried previously. The problem is, even if there were an objective measure of "smokeiness", there are different sorts of smoke tastes. Usually TCP ("phenol") content is the numeric measure of how smokey a given Scotch is, ranging from 0 pmm or close to it, up to around 170 pmm (Octomore). However, there are a number of problems with that measurement being used. The biggest is that TCP only measures a specific component of smoke flavor, and in fact one of somewhat less importance. TCP is responsible for the sharp, chemical smoke flavor. However, polycyclic aromatics are responsible for the majority of "smoke" flavor. In fact, many fuels, such as wood, create relatively low proportions of TCP compared to peat. As such, it is more of a ballpark figure, and even then only if you are discussing alcohols smoked with the same fuels. As implied by the terminology I chose, it can be difficult to separate the smoke taste from the other tastes involved. There is even disagreement as to what constitutes "smoke"/"peatiness" - are "iodine" and/or "phenol" part of it, or entirely separate? If they are separate, can people reasonably separate them in tasting? I am skeptical how useful a number could possibly be with the wide variety of smoke flavors to discuss. It's not just that the number would amalgamate many distinct flavors, it's also that different people are differently sensitive to the varying flavor compounds and might find the numbers ill-represent their actual experience because of that. As such, any number you might come up with is going to have a wide margin of error, since no one is going to agree on how "smokey" a given alcohol is. 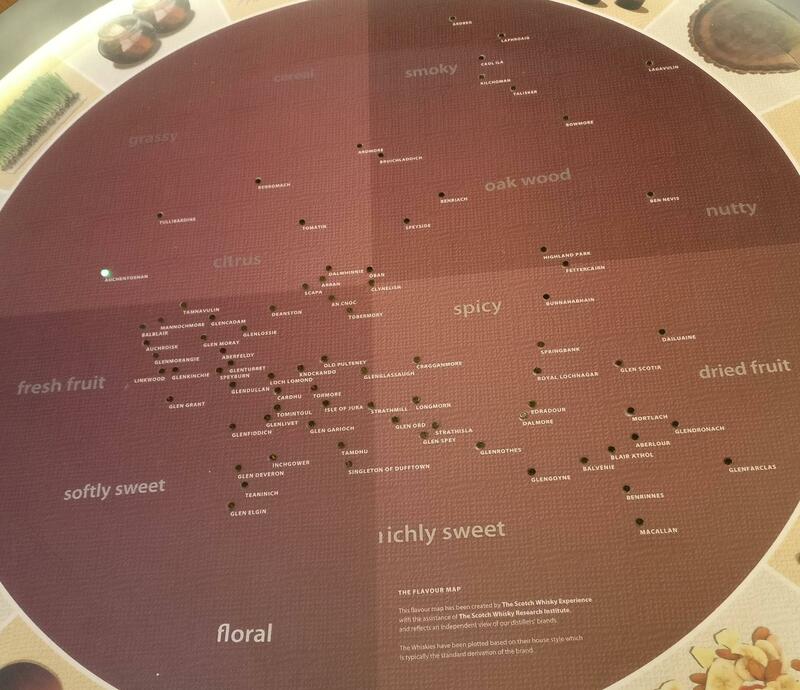 It is of course theoretically possible to generate a number based on analysis of many different flavor compounds. However, that has not been done, and likely will not be. Even if it was, people would still have differing sensitivities. The closest you are likely to get is TCP ppm measurements and arbitrary numbers offered by reviewers. Not the answer you're looking for? Browse other questions tagged whiskey or ask your own question. Whiskey and beer recommendations for boilermaker cocktail? How to select upper-tier whiskies without trying them first? What does it mean that multiple whiskey brands come from the same distillery? Are there any vodka cocktail recipes for someone who likes whisky/scotch?